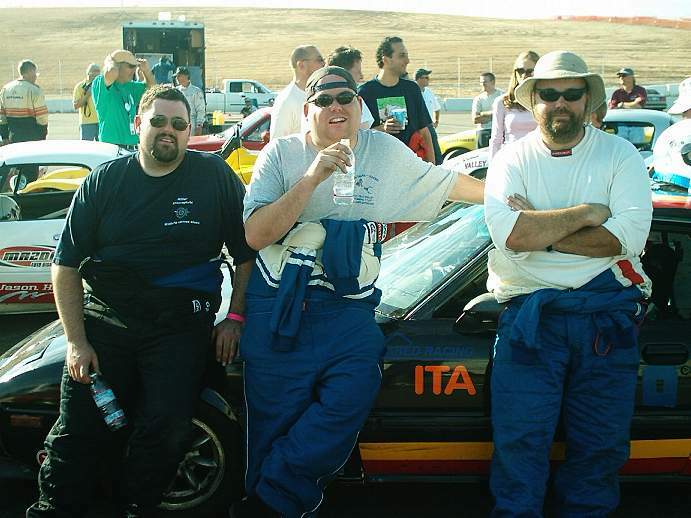 Shed Racing's Tom Aiken crossed over to race with the Sports Car Club of America's San Francisco region for the inaugural "Grand Prix of Willows" at Thunderhill Raceway Park. Modifications to the car to fit the NASA GTI Cup class are against the rules for SCCA Improved Touring "B" class, where the car would be normally run, forcing Tom to run in the catch-all "ITE" class, against modern Porsches, BMWs, and Turbocharged Mitsubishi Evolutions. Tom was on his own for most of Friday practice and qualifying, with Bryan and Angie from the Miller Motorsports entourage showing up Friday afternoon, followed by Marcus and Robert Saturday morning, and Scott Miller and Scott Lipton Sunday morning. Things got off to a shaky start Thursday evening, when Tom was swapping around tires and reinstalling the front sway bar from the last race weekend, he discovered the muffler hanger bracket weld had broken from the frame rail. By the time the discovery was made, it was too late to fix it that evening. First thing in the morning, Tom scrounged a proper size bolt, and drilled and rehung the muffler, then had to rush to get the car to tech. His lack of familiarity with how SCCA ran things caused a delay of 15 minutes at tech, before he learned he first had to go to Registration and get signed in, and pick up a tech sheet. Once this was done, Tom rushed back to impound, as his race group was forming for the first session of the day. He got through tech, and rushed back to the paddock to get into his driving gear and made it out on track 5 minutes into the morning session. Unfortunately in the rush, Tom missed a few things, like checking the tire pressures and fueling the car, and starting the video camera. The incorrect tire pressures made for handling best described as "interesting". The two qualifying sessions were much better after air was added to the tires, and fuel was added to the car, with times improving, and a best lap in the 2:23 range in the first session, and 2:21.x in the second, putting Tom last in class (as expected), but 24th out of 30 overall. The race was clean and generally uneventful, with Tom finishing 21st overall, and 11th of 12 in class. Best lap of the weekend was 2:20.7. Marcus showed up with the ITA RX-7 Saturday morning, and the crew started changing the front suspension and prepping the car for the 4 hour enduro Sunday afternoon. Comparison of how loud the car was to others cars in the paddock, led the team to believe that it was much too loud, and there was no way to run the car on track without getting black-flagged for noise. Miller Motorsports team photographer Geoff Crall came through by retrieving a new muffler from Marcus's house in San Jose, and delivered it to Scott Miller's house in Fairfield Saturday night, so Scott could bring it to the track Sunday. Robert installed the muffler first thing Sunday morning. The new muffler solved the sound problem, and saved what could have been a short weekend for the Miller team. Marcus, Tom and Scott all took turns in the morning enduro practice while everyone else prepared the assigned pit stall for the afternoon race. Morning practice times were used to set the starting grid, where the team qualified 41st of 48. Marcus drove the first 30 minute stint, followed by the first of the two mandatory 5 minute pit stops. 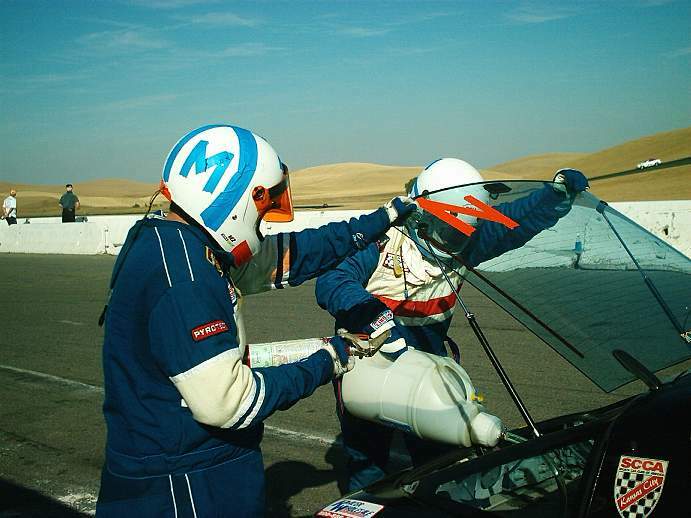 After fueling, Tom got in the car and drove the next 40 minutes, before being called in for the next fuel stop, where he passed the car to Scott Miller. Scott ran a 40 minute stint, when he was called into the pits while the pace car went out for a full course caution. After fueling, Marcus again took over the car, and ran only 25 minutes when he came in for an unexpected fuel stop. For some reason, the fuel consumption increased greatly as the race wore on. The car was fueled, and Marcus went back on track, but returned after only a few laps with a flat driver's side rear tire. Unfortunately the only spare tire available was an old well worn Hoosier, to go with the Toyo RA1s on the other 3 corners. Tom took over the driving duties after the tire change, and took the next few laps feeling out how well the car handled with the mismatched tires. Tom ran for about 35 minutes, when the car started sputtering as the fuel level ran low yet again. Scott took over the car for the last stint, with the hope that the car would be able to reach the end of the race on fuel. Unfortunately this hope was short lived, as Scott hit the pits for fuel with about 15 minutes left in the race. A quick splash of gas got Scott on his way, and he drove the car through the end of the race. When the checkered flag flew, the Miller Motorsports/Shed Racing team finished 34th of 44, completing 82 laps, in what was the car's first time on track. Considering the car has an 8 gallon fuel cell which would only feed 4 1/2 gallons reliably, this has to be considered a success.